We kicked off the third season of Truants with an Ancient Naval game today at The Game Matrix. Having just received the excellent 1.5" hexed mat from Hotz Works, I figured it was time to get my 1/1200th Ancient fleets bloodied. 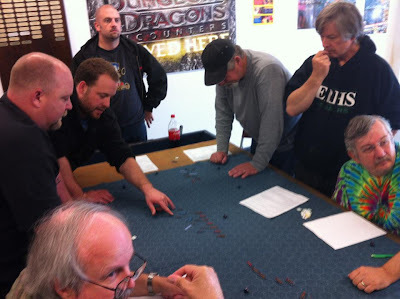 I chose a free set of rules called Diodochi for the inaugural event. These rules are amongst the many listed on the Hotz Roman Seas site. I have Roman Seas too, but figured for fleet action with multiple squadrons, Diodochi may work a little better (read simpler and faster-playing). With some, or maybe a lot, of great suggested tweaks/improvements, Diodochi was agreed upon by the experienced Truants as a decent set to work with. 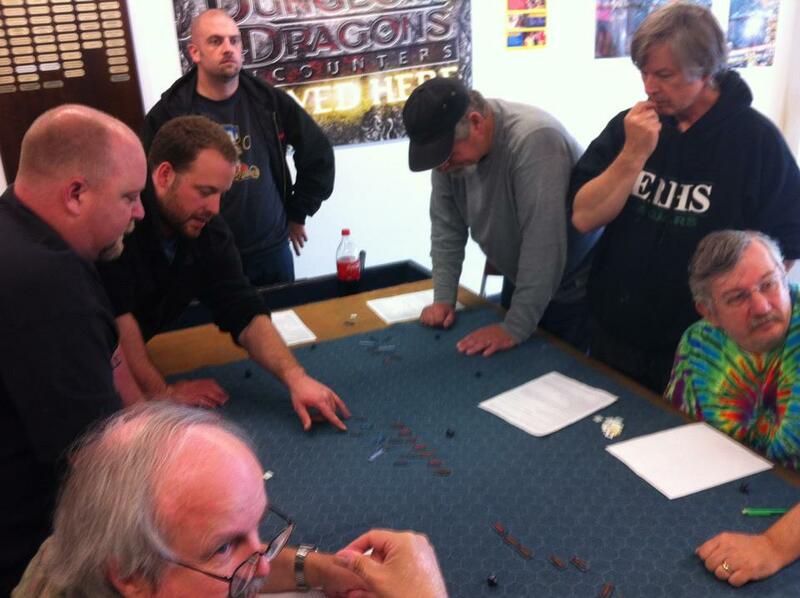 There were 9 players with me GMing (or pretending to be). 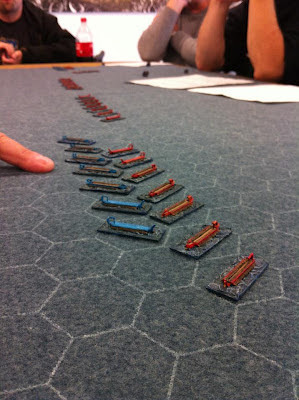 Each of the players ran about an 8-ship squadron. Everyone started out with their squadrons in Line Abreast - the best way for attacking. 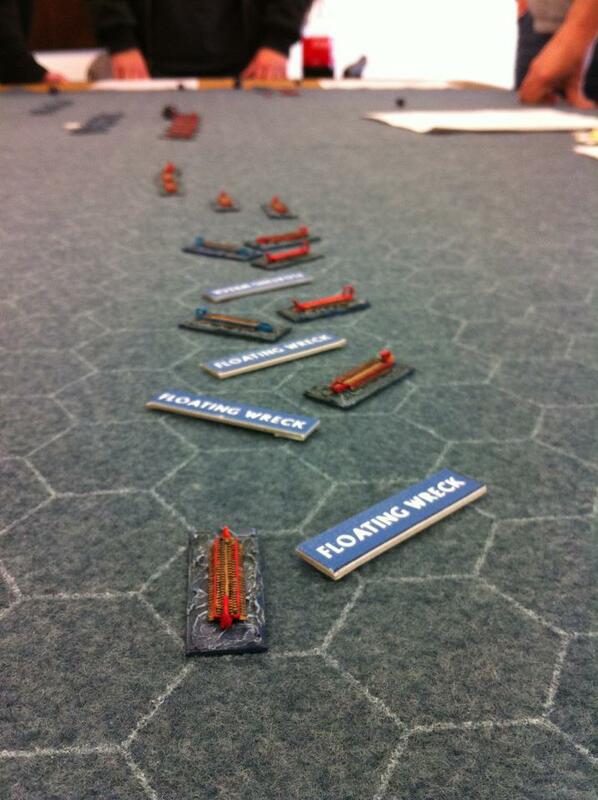 I even got to use some of my Roman Seas (1/300th scale) markers. Even a gigantic Grapple marker that Al just had to use! It was a very close game with the red fleet narrowly beating the blue. 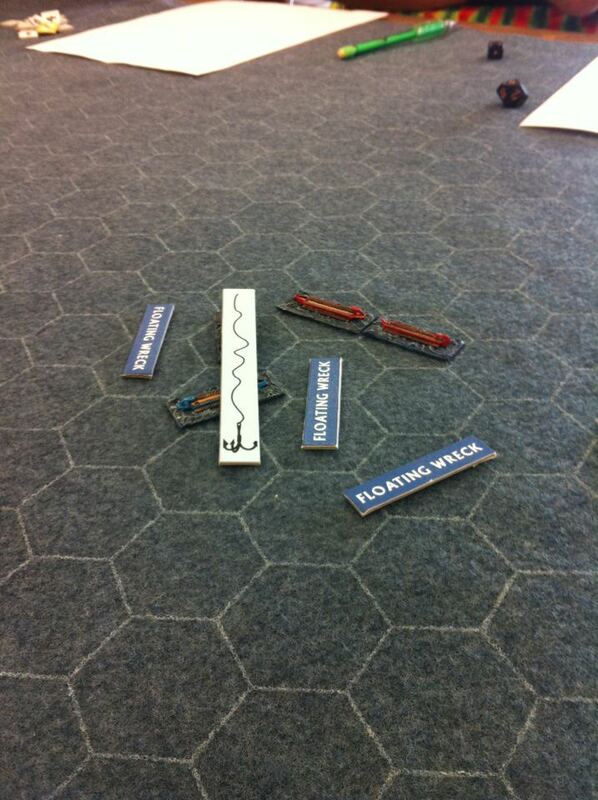 The rules include missile fire, combat with ram, raking, grappling and boarding rules. I intend to run this at conventions and similar venues where no prior-rules experience being needed. All of the gamers, except for one, have years of experience with many sets of rules, including naval, so this was a great play test which I received a lot of great feedback and suggested improvements. Stay tuned for more Friday Truants' gaming posts. Disclaimer: I stole all of the photos off of Adrian's Facebook. An interesting looking game, I'll look forward to more from the Friday Truants!! Thanks, Ray. There will indeed be some more cool games. The schedule varies from VSF on Mars to Vietnam and everything in-between! Dean- I love this period and have been itching for a reason to paint up galleys, but like you never found a "fun" set of rules. Keen on watching this develop. I like this era of naval history too. I have GMT's boardgame "War Galley" and I even have and old copy of Battlelines' "Trireme." Thanks for the interest, Gents.